Day 17 we are moored in Market Drayton just past bridge 65,it's a lovely sunny evening after a very chilly day but we did not get the weather from the south. Other wise just a nice days boating. A few pictures of things we have come across on our way from Gnosall and Wharf Tavern near bridge 55 south of Market Drayton. There are so many impressive embankments and cuttings on this part of the Shroppie which is partly why it has long straight sections. To protect the embankments in case of a breach Telford had a very simple solution with a stop lock at each end. They would automatically close if a breach happened. Now they are slowly rotting away. Another one of the impressive cutting bridges in Woodseaves. Day 15 totals to date are 39 locks and 105 miles. We have opted for a route of more miles but 100 less locks of which 80 odd are big heavy double locks on the Grand Union main line via Birmingham. All the locks we are doing are the much lighter single narrow locks. Yes we have taken the easy option for a change. Today has been much better weather wise with no heavy rain just light on and off showers and no accidents. My bruise has really come out now it's a bright beetroot colour. We are now moored in Gnosall by bridge 54 a mere 10 miles and 1 lock in 4.1 hours. The S U has some impressive cuttings and embankments especially when they were built by hand and horses to move the spoil around. Nb Prince is a 'Royalty class built for Associated Canal Carriers in 1931. They just look so large when they have no cargo on-board. The narrow boat was made for a local carnival - unfortunately the lady said they didn't win. We awoke at 08.00 to rain which was forecast for all day. We need to charge the batteries each day so -its not bad weather its wrong clothing. So with full wet weather gear on we set off at 09.30 and cruised down to Autherley Junction and turned onto The Shropshire Canal and cruised through to just before bridge 8 south of Brewood stopping at 12.30 in the rain. I have only fallen in once before just after we had the boat - I have now done it twice!!!!! As we were coming in to moor Anne had hopped of the bow and I was going to get off to sort out the stern. Well as I went to step ashore I suddenly realised that the boat had drifted out and the gap was too big. Too late I was committed and had no way back - the only way was down and on the way down I bashed my bum on the side of the boat. A lovely bruise is now developing. Therefore the only thing that is hurt is my pride and my bum. Anne had to get the mini washing machine out to deal with all the wet clothing. Another days boating is over. As we approached Autherley Junction we came through a series of narrows. They were built by Brindley’s navvies during the construction of the canal through solid sandstone which had come through the clay strata. Luckily we did not meet another boat although there are a couple of passing places. It's now Day 13 (Thurs 26/4) Yesterday we had sun and showers so only did a short day and stopped in Penkridge at 11.30. We walked into the village and had coffee and lunch in a small but excellent cafe called Kaffeine in Market Street. Today Anne’s sister Sue and her husband Graham together with friends Denise and Jim came to give us a hand up the 7 locks in return for coffee, doughnuts and lunch - it seemed a fair exchange. It made for a very pleasant day with added warm sunshine when we stopped for lunch below Gailey Lock. The bridge holes on the Staff & Worcs are very tight,this is the entrance to Gailey Lock with the very distinctive round house which was originally a canal toll house. Our mooring tonight is out in the countryside just before bridge 74 on the way towards Coven. Today is now day 11 and we are moored up in heavy rain just before bridge 94 near Acton Trussell with the fire glowing nicely. We have spent a few days at Great Haywood as we wanted to see my old mate Jeff. He lives at Uttoxeter which is just a quick bus ride from G H as he is recovering from a recent op. We left this morning with a forecast of April showers and turned at Haywood Junction onto the Staffs & Worcs Canal finished in 1772. - well it's been raining hard so we gave up after just 2.9hrs, 2 locks and 7 miles. Tixall Wide built for the gentry who lived in Tixall House so that it appeared that they didn't live next to a canal. One of the most enjoyable elements of canal boating is the lovely,fantastic,quirky,amusing,surprising,frustrating at times or just down right weird things that you come across as you slowly move through/around the country on our waterways. Which is why they are such a quintessential part of our Island. Day 7 (Fri 20/4) was a day in particular. We had just moored up past bridge 68 north of Rugeley over looking the River Trent when a man stopped to chat - kitted out for serious walking. He was retired military who was doing something that he had always wanted to do - Walk from Lands End to John O’Groats. He showed me his series of maps which showed his route each day and where he would be stopping-either camping,B&B or on some occasions people he has met have offered free rooms or even the odd barn. We provided water,cake and took his rubbish for disposal. Having then rested he set of along the Staffordshire Way and then the Pennine Way leading him to Scotland. Day 8 (Sat 21/4) After our rural mooring yesterday we headed into Great Haywood, It took just over an hour arriving at 10.30 to get an excellent spot looking towards Shugborough Hall. The coffee shop at the Canalside farm shop by bridge 74 provided good coffee and cake. It turned into another glorious spring afternoon so a visit round the hall was in order along with a lot of other visitors. The National Trust has only recently taken it fully over from Staffordshire Council and there is a lot to be done. Day 6 (19/4 Thur) It was a lovely spring day for cruising with the temp upto 25c. We are now moored north of Hopwas on the Coventry Canal just before Tamhorn House Bridge. The problem for the day was to try and find out why I cannot down load the pictures from my camera memory card onto the tablet. There are two cables connecting the card reader to the tablet. I swopped one of the cables for another but still nothing. Anne suggested to swop the order around and success it connected- hey ho!!!! I can never resist a picture of the CRT building with its distinctive clock tower. Our mooring just after bridge 50 just before Polesworth. Day 3 (Mon 16/4) the scenery around the bottom of Hillmorton locks is in the process of being changed forever. We came through here about 18 months ago and there was a lot of civil engineering works going on. I spoke to a lady walking past the boat who said it was a new road from the M1/A5 into Rugby and they had started on a new bridge as you approach bridge 66 on the canal. All the lovely long gardens have gone to make way for it. Our other surprise was the changes to moorings at Brownsover Park important for the closeness of the Tesco to bridge 58, for the heavy essentials. Last time we were here we had to put pins into the soft towpath grass - one of which was ripped out by a passing boat. This will no longer happen as a considerable number of rings have now been installed.The only down side is that there is no longer mooring allowed past the bridge as you head towards Newbold, CRT have rebuilt the towpath which really needed to be done. We moored up in Ansty and had luckily just finished cooking when the gas ran out. No problem just swop the bottle over but to no avail.Thought the auto switch over valve not working therefore first priority is to get this sorted out in the morning as we have no other means of cooking except for the bbq. Day 4(Tue 17/4) I was up at 06.00 to a very chilly morning with a strong breeze. First stop was Star Line Cruisers in Nuneaton who were very helpful and it was simple to fix. The gas had leaked out of the connection to the spare bottle over the winter, so after the purchase of 2 new gas bottles calm was restored with coffee. We are now moored up just past bridge 27 and the Atherstone lock flight beckons tomorrow. I am writing this off line on my tablet using Microsoft docs and will then cut and paste it into the blog when we have a good 4g signal on Anne’s phone. 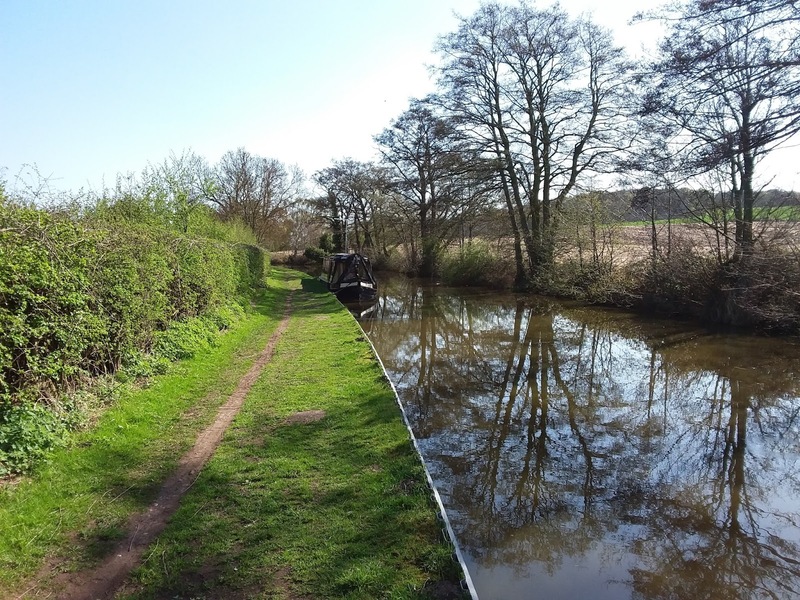 Day 5 (Wed 18/4) glorious sunny warm day went down the 11 locks of the Atherstone flight in lovely warm sunshine. Not many boats about and had the flight mostly to our selves. I now have a problem with downloading the pictures from the camera memory card into the tablet. It doesn’t want to recognise the card reader for some reason. In fact it was playing up a bit the other evening and on pushing the connection in a bit harder it connected. Tried all that tonight and nothing happened. I may be only able to use pictures taken on the tablet. Hopefully all this will post ok!!!! Our pre trip into the butchers at Braunston for his great meat,pork pies and sausages - no trip would be complete without something of his in the freezer. Change the domestic water supply pump which had decided to spring a leak. It's now day two and we have moored up on the armco below Hillmorton locks. It's now raining hard the fire is alight and the tv is set up. What a change from yesterday afternoon when we left the marina in t shirts and a lovely warm spring afternoon. Its the joys of boating and only another 81 locks and 166 miles to go!! Spring is here and the lamb was enjoying the warm spring sunshine. We decided to go up to the boat over Easter to get her ready for our first long trip in 2 years - we are off to Llangollen in a few weeks. We only managed one job and that was to wash the roof and as the weather was so bad no trip out. Therefore no proper boat pictures so just one of a 7mm model of a 72ft Star class motor boat. The picture is taken in the wharf area of my 7mm narrow gauge layout called Shrewsbury Wharf. The loco is on a siding of standard gauge track feeding the wharf. W H Cowburn & Cowpar started trading in the 1870s as chemical manfacturers. Swallow was built in 1934 and used to carry carbon disulphide for Courtaulds in the manufacture of artificial fibres.This traffic declined after the 2nd world war and boats were converted to carry coal and I have assumed general cargo. C & C stopped canal transport in 1956. I have created this entry through notes on the tablet and then cut and pasted it into the blog entry. Its then been posted via Anne's phone using it as a wifi hotspot via tethering- success.